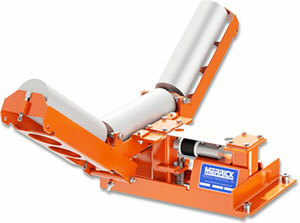 Model 475 | Belt Scale | MERRICK Industries, Inc. Single or dual module 475 installations are components of an NTEP approved scale and can be upgraded to NTEP compliance by adding weigh modules in the future (minimum three modules required for NTEP compliance). Certificate of conformance, number 92-196, was issued under the National Type Evaluation Program (NTEP) of the National Conference of Weights and Measures. The certificate is for capacities of up to 3,480 STPH with belt loading of 14.5 to 145 lb./ft. at belt speeds of 100 to 800 FPM.